Athletes are celebrating the final leg of the Special Olympics torch relay Thursday as they run through Los Angeles' city council districts ahead of this weekend's Opening Ceremony and the World Games competition. Special Olympics participants accompanied by law enforcement officer left the Millennium Biltmore Hotel on Grand Avenue as final torch ceremonies began Thursday morning. The ceremonial runs, part of a partnership between the Special Olympics and law enforcement agencies from across the country, will cover three routes in each of the city's 15 council districts, ending at 5 p.m.
Three teams are carrying three torches for the citywide celebration. The Flame of Hope will be part of a ceremony at City Hall Friday morning before it lights the ceremonial caldron during the Opening Ceremony Saturday in the Los Angeles Memorial Coliseum. After the original torch was lit in Athens in May, three other torches were ignited in Maine, Florida and Washington, D.C. and carried across the country in the first-ever Special Olympics United Relay Across America. 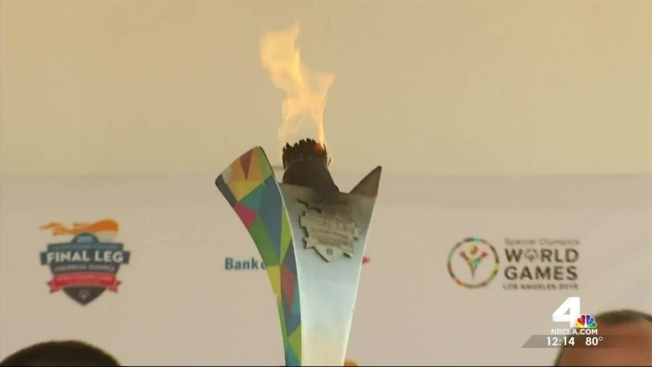 Participants ran, biked and walked with the torch, known as the Flame of the Hope, across all 50 states before the three legs of the relay converged on Bank of America Plaza in downtown LA to light the Special Olympics caldron.